I exercise 6 days a week. Mostly, I run, but there are a couple of days during the week where I walk briskly through my neighborhood. These are days when my old body needs to recuperate so that the following days I can beat it mercilessly with a run. And, I love to run! I eat well. I eat daily roughly the same things, I'm okay with that, but I do allow some indulgences every once in a while. I just run more...but my diet is more balanced than it has ever been. I drink water. 64 oz. is my minimum. I have always been a water drinker but I have certainly kicked it up a notch. I panic when I forget my water bottle. What will I do? Why? Because I know that at the end of the day I am going to feel miserable because I haven't hydrated enough. I am amazed at how well I feel now that I keep myself full of water. On Thursday, while many people were still sleeping in on their day off of work, I got up at 6 a.m. and drove to a small town with about 300 other crazy folks and ran in a 5k race. After the race I went to my annual Thanksgiving feast, but after the eating my children and family went for a hike through the woods. Instead of sleeping off that turkey, we hiked it off. My life has certainly changed! I have learned through it all that the strength was always there, it was just being pushed around by self-doubt. It was trying to break free from within, it was in there screaming, "I'm here, just call upon me!" I have a necklace that I wear daily, it reads, "All the strength you need is already inside of you." 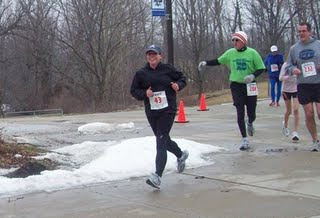 Now, I run, for life, for hope, for my health, and to push my inner strength. I ask it each and every day, "how strong are you?" It was about two years ago...that I found my STRENGTH. What is it about this book? My third grade teacher read this book to me, stopping at very important parts of the text for us to hang on the cliff until the next day. It's the same today, I stopped when it was time for music and I heard the groans from my children. "Awwww, we have to stop?" I think that teachers underestimate the value of reading aloud to students. When children hear that rich language flow from an adult they soak it up like a sponge. Teachers must be aware, they must practice, and they must use those tried and true texts that they love. Children notice when you haven't read the text prior to the performance. They will notice when you don't "perform" well. When do you use the read aloud in your classroom? When do your students get to settle in and fall in love with a text? -In the morning, to open the day. This is a time to enjoy new books, or read books that you will study later, or when you are able to use a book to discuss procedures or how to treat one another nicely! The opening read aloud is so important! -During interactive read aloud, this give students the opportunity to discuss, share, and express themselves. Discussions like these really give me insight as to how my students are understanding the comprehension strategies, but it allows them to think critically. Really higher level thinking occurs here. -Chapter book read aloud- for first grade this is difficult because their attention spans are all at varying lengths. We start with very short books, like Junie B. Jones, Magic Treehouse, and Frog and Toad. Now, we are moving into lengthier texts, like Boxcar Children and Charlotte's Web. This book is to discuss, to retell, and to just lovvvveeee. - Thematic Books- these are books that introduce topics in Science, Math, or Health. Children need a wide variety of different types of books when you are introducing a topic. Some children enjoy poetry about animals, nonfiction books that give information, and even fictional characters that teach us about topics. Reading aloud is so important! But, I have also been mentoring myself with good professional books. They have been taking me back to my basics, they have been pumping the air into me and pushing the air out of me. Breathing for me when I haven't found the air on my own. Georgia Heard, Lucy Calkins, and Debbie Miller to name a few have been asking me,"what's important here?" "What do you know about how children read and write that will help you make THESE kids successful?" I am aligning my practices and diving back into the water. I have work to do, and the establishment can go along their merry way. I am effecting student achievement, I am producing readers and writers. I know what I am doing, I have research backing me, and a whole ensemble of specialists guiding my every move. 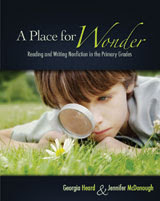 One of the books that I received from Stenhouse Publishing Company was Georgia Heard's new book that she wrote with Jennifer McDonough called A Place for Wonder. You can read some of that new book here, and you won't be disappointed. First of all, love Georgia Heard, not sure why she seems to speak to me personally when she writes but she is just so passionate about encouraging our youngest writers. I love her poet's eye view of the world and she fosters that in this book. This book is littered with quotes about wonder, writing, and wonderful encouragements for teachers. She seems to understand the plight that we are all in this topsy turvy world of assessment driven instruction. And yet, she doesn't stray from the fact that our youngest learners need to be held in their world of wonder, that that world need not be taken away from their early in their learning. She understands that school can be a place where children are dumped information into their little minds instead of discovering it for themselves. 1. My Aha moment came when she discussed how students withing Jennifer's classroom were researching their wonders to make an All About Book about their wonder topic. They had several texts, website, and copied information (that was developmentally appropriate for 1st graders) within the classroom. They put these materials in logical common places and students were allowed to peruse them during Reader's Workshop, but, they were not allowed to remove them from the area to write down what they learned. In an effort to keep them from copying the resource the students were not allowed to remove the materials, they had to go back to their writing spots and jot down, in their own words, what they had just learned. Oh, so that's how you get young writers to not just copy the words out of the resource!!!!!! Duh! 2. The Wonder Wall, a place where the community of learners can write their wonders in public and then the other members of the community can use what they know, their prior knowledge, to answer the question. Jennifer brings a wonder to the whole group then once a week and asks the community to help answer the question. My students have been loving this aspect of their wonders. It has given them expertise about subjects that are sometimes not covered in my basal. It requires them to think about their inferences and to use their judgements to figure out real wonderings. It also has helped the community to know that we are all experts about certain things because of our interests. How does a snake eat such big things when they are so long and skinny? How do the shark's teeth get out of its mouth and into the sand? Why is that shark tooth black? How do the people who sell shark's teeth collect them all to sell? Where do all the colors come from on the shells, and why are they all different? I can't wait to begin our unit on nonfiction, we have so much knowledge now about text features, and we also have things that will be so much more interesting because we have asked ourselves questions! If you are looking for a good read then buy this book, you will not be disappointed because Georgia has done it again!